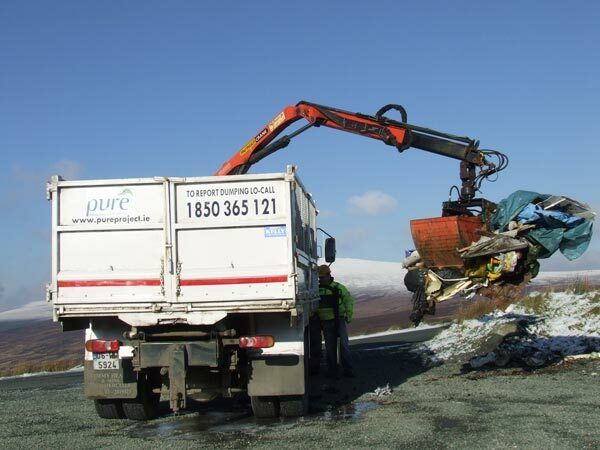 The PURE project is a regional partnership initiative which aims to combat illegal dumping and fly tipping in the Wicklow/ Dublin region with support and co-ordination of resources from all stakeholders who are affected by illegal dumping in the Wicklow/Dublin uplands. The project has a dedicated clean up vehicle to provide more efficient clean-up response time to incidents of illegal dumping and report on individuals who are involved in such activities. Since the establishment of the project in 2006, there has been over 9.600 reports of illegal dumping resulting in over 9,300 collections and the removal of over 2,900 tonnes of rubbish from the landscape. ‘The PURE Mile’ is an environmental initiative of the PURE project which aims to foster a greater appreciation and awareness of our country roadscapes by rewarding and acknowledging local community efforts. This can be achieved through keeping a mile stretch of road (approx. 1.6 km), and the immediate environment litter/rubbish free, while simultaneously considering the preservation and careful maintenance of the flora and fauna, ditches, hedge-rows, and any other natural or man made features of the area. The Pure Mile encourages the people who live on a mile stretch of road to work together to enhance and improve their environment, their heritage and community. The simple act of clipping back a hedgerow on a dangerous bend, repairing or painting traditional gates, retaining stone walls and stiles in good condition, identifying heritage features, and the regular picking up of litter and rubbish will benefit both local people and the local environment. In all cases sensitive and minimal intervention is encouraged. In Miles where very little physical management is required, groups can focus on local research, or on initiatives to increase awareness and appreciation of their area among the local community. The PURE Mile is open to all community and local groups, existing and new, e.g. There is over €4,000 worth of prize money to be won and all entries will feature in the PURE Mile Calendar. Pure Animation is a two week environmental/animation training programme for teenagers. The training programme has taken place in South Dublin, Dun-Laoghaire Rathdown and in Wicklow. The course introduces students to important environmental issues that are related to The PURE Project, e.g., illegal dumping, litter, fly-tipping, recycling, pollution, etc., through the medium of stop motion animation. Under the guidance of experienced and professional animators and tutors, students create their own storylines, characters, scripts, story boards, set design, animation techniques, and learn how to direct and create their own short animated films. To date over 100 teenagers have completed the PURE Animation training programme and the entire collection of shorts can viewed on the PURE Animation Movies section of this website. Pure Music Environmental Training Programme is an initiative of the Pure Project and is funded by it. It is a two day environmental/music training programme for teenagers (13 to 18 years old) who are involved in a music class, play a musical instrument, in a band, or sing. In 2015 The Pure Music Environmental Training Programme traveled to six schools in Wicklow, Dun-Laoghaire Rathdown, and South Dublin where each school recorded an original environmental music track. These schools are now competing for the prize of one a day professional recording session at the Temple Lane Studios in Dublin where acts such as, Snow Patrol, Kanye West, Rihanna and Morrisey have recorded. The winning song/video will be based on 2 aspects, the group who gets the most hits/views, and the judge’s decision. Judges will be comprised of, a representative from PURE, The PURE Music Facilitator Muso and renowned Irish musician, Dave Hingerty, who has played with The Frames, Josh Ritter, The Swell Season, and most recently, Kila. The winner will be announced on the 12th July at the launch of the PURE Multi Media Environmental Awareness Exhibition in The Courthouse Arts Centre Tinahely and the group will record their track in Temple Lane Studios in Temple Bar Dublin on 1st September. Visit Pure Music for music videos and for further details of Pure Music Environmental Training Programme.